On the day of your LASIK procedure, it is natural to experience both excitement and nervousness. Understanding LASIK and trusting your surgeon are important to helping you feel confident, calm, and prepared on the day of your procedure. Each center does LASIK differently. In the paragraphs that follow, I describe how LASIK is done at our center. You will need to arrange for someone to drive you to the surgery center and pick you up when you’re ready to leave. You won’t be able to drive immediately after the procedure because your vision will be blurry for a while. You should plan to spend about two hours at the center. Wear comfortable clothing the day of your surgery. Do not wear makeup, skin moisturizer, perfume, or cologne because LASIK requires clean, sterile conditions. If you usually use makeup, use makeup remover to be sure all mascara and eyeliner is removed; you don’t want these contaminants getting into your eye during surgery. LASIK is performed while you are awake. You can’t be put to sleep under anesthesia because we need you to look straight ahead during the laser treatment. To reduce your anxiety, we offer you an oral sedative, similar to Valium. You don’t need to take it if you aren’t nervous. Figure 18. 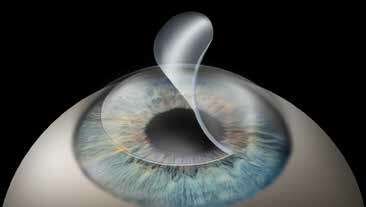 Top: A LASIK procedure begins with the surgeon using a laser to make a flap on the surface of the cornea, providing access to the cornea tissues underneath. Middle: Using an excimer aser, the surgeon reshapes the exposed cornea, correcting vision. Bottom: After the cornea is reshaped, the corneal flap is replaced; it stays in place without sutures. Before the surgery begins, your face is cleaned with a disinfectant, and a surgical cap is placed over your hair. You are given eyedrops to numb the eyes, which may sting for a few seconds. No needles nor injections are used. Once in the laser suite, you are positioned comfortably, lying on your back in a reclining chair. The surgeon talks to you throughout the procedure so you know what is happening and what to expect next. More anesthetic drops are placed in your eyes to ensure they are completely numb. If you are having all-laser LASIK (which is the case for almost all of our patients), the surgeon first places a gentle suction ring on the sclera to hold the eye motionless while the flap is made. You feel a mild pressure when this ring is placed on your eye. The laser flap maker is then lowered into contact with the suction ring, blocking your vision. You can’t see for thirty seconds while the flap is made, which can be scary. This is normal. The suction ring is then removed and the flap is made on the other eye the same way. The surgeon then swings your reclining chair under the excimer laser. A small retainer, called an eyelid speculum, props open your eyelids to keep you from closing them during the procedure. The eyelid speculum does not hurt. 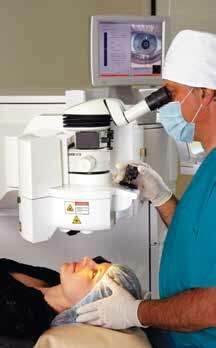 The surgeon gently lifts the hinged flap and proceeds to apply the laser to correct your vision. This usually takes twenty to ninety seconds per eye. 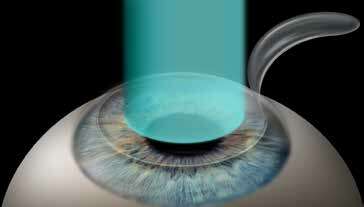 You do not feel any pain as the laser sculpts the cornea by vaporizing small amounts of tissue. You hear a clicking or buzzing sound with each pulse of the laser while the surgeon is reshaping your cornea to correct your vision (Figure 18). After the cornea is reshaped, the surgeon rinses the surface of the eye. The surgeon then carefully replaces the corneal flap in its original position. The eye creates a natural vacuum that holds down the flap. The flap adheres like Velcro, so no sutures are necessary. The eyelid speculum is removed. You are now able to blink normally. The whole process takes five to six minutes per eye. Your vision is hazy at first, but you immediately notice that it is improved compared to before LASIK. You can read a clock across the room. You sit with your eyes closed for about thirty minutes. Then your eyes are examined one more time to ensure that the corneal flap is properly positioned. Immediately after surgery, your vision is somewhat blurred and hazy, similar to looking through dirty glasses. You may experience some burning or a gritty feeling in your eyes, which may last up to six hours. We give you a sedative to take when you get home. It is best to have your eyes closed for the first few hours after surgery, and sleep is the easiest way to accomplish this. After your nap, the discomfort is usually gone. LASIK surgery is performed on an outpatient basis. You will be sedated, but will remain awake during the procedure. Your eyes are numbed with anesthetic eye drops, so you will feel no discomfort. 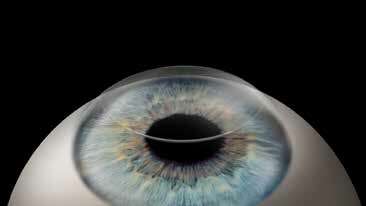 A LASIK procedure typically takes five to six minutes per eye. Photo courtesy of Abbott Medical Optics. Upon awakening the next morning, you will typically experience a dramatic improvement in vision. Most people see well enough to drive to their next-day checkup.